The Passport Sleeves collection comes as a two-pack and each sleeve in the pack is a different design. 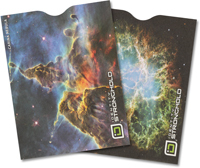 This pack contains our Nebula designs. As described; arrived on time; will use again.